If you adore the Amalfi Coast, but abhor the crowds, Maratea is for you. The road in is even bendier and narrower than the infamous Amalfi Coast road, but the similarities don't end there. There's also a stylish harbour, a charming medieval village and a selection of pretty sandy coves where you can find many of the best places to stay in Maratea. Don't get the impression that Maratea is a secret though. The word is definitely out! There are just less hotels here, so even when full Maratea feels less touristy. And its popularity with Italians probably helps too. Maratea was a favourite of Frank Sinatra, Princess Diana and Fabio Cannavaro, probably because it really lets you feel like you're getting away from it all - the population density here is apparently similar to that of the Amazon! The lovely port is a collection of white and yellow buildings, full of charm, while on the water you'll usually see a small herd of glitzy super yachts. The historic centre is at the top of the hill - a whitewashed town underneath Maratea's answer to Rio's Christ the Redeemer. This is where you’ll find some of the best places to stay in Maratea, the rest you’ll find tucked away along the coastline. Maratea claims to be home to forty four churches, so take some time away from the beach and discover these historic buildings and their charming artworks. Amble through the narrow streets of Maratea and end up in the main Piaza Buraglia for a drink and some serious people watching! Climb the hilll above town and visit the statue of Christ the Redeemer - Il Redentore. You'll also be able to soak up some stunning views. Dpn't forget that this small town will be very busy in the peak summer months. So if you want to guarantee a room in one of the best places to stay in Maratea during July or August, do yourself a favour and book well ahead. Althernatively plan your visit during the shoulder season when the hotels will be much quieter and the rooms slightly cheaper! La Locanda delle Donne Monache is tucked away in the heart of medieval Maratea, a mid-size hotel converted from an 18th Century convent. The interiors are modern, the views and the food are sublime and steeped in local tradition. 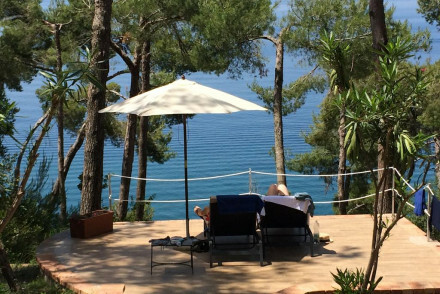 The Villa Cheta is slightly younger, an Art Nouveau villa tucked into a hillside with wonderful views of the Mediterranean. The villa has its own private, pebble beach, but there's also a hotel shuttle to a sandy beach close by. Santavenere Hotel is a 5* spot right by the sea, boasting its own private beach area. You'll adore their classically elegant rooms and fine dining restaurant, and if you don't fancy swimming in saltwater then there's an indoor and outdoor pool to choose from. A truly first-rate stay. Maratea is about halfway between Naples International Airport and Lamezia Terme Airport. Both of these airports offer scheduled and low-cost flights to many European destinations. From Naples it’s about two hours and ten minutes by train or car to Maratea, and from Lamezia Terme it’s about two hours by train and an hour and a half by car. Alternatively you can catch the train down from Rome, or by boat if you happen to know someone who’ll drop you off! If you want to hire a car - which we strongly advise if you’re staying in Maratea and want to see more of Basilicata and the Amalfi Coast - we recommend you visit our online partner, Rentalcars. Maratea is at its most glorious in the summer, when you can linger in the piazzas and laze on the coast. But it’s small, so you need to book ahead if you want to make sure you’ll have somewhere to sleep. Still not sure which is the best place to stay in Maratea for you? consider the best places to stay in Matera? 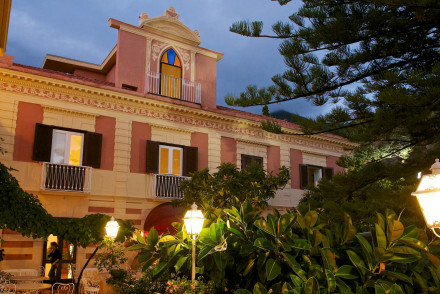 Charming hotel in Maratea, enclosed by terraced gardens and with easy access to the beach. The rooms are classical in style featuring bathrooms with handmade majolicas and many with balcony or terrace and a sea or garden view. Ideal for active families, there are two outdoor pools and a sauna. Beach Life - With its own private beach, reached only by enclosed pathways that wind down to the beach from the hotel. Weddings - Ideal for a wedding venue, the hotel organises all catering and management needs. Fishing - The hotel organises fishing trips on boats for guests. 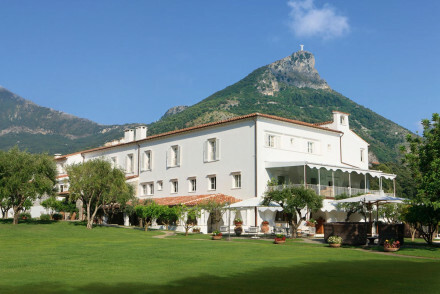 Charming hotel in a converted convent, built in 1735, tucked away in the mediaeval town of Maratea on the Basilicata coast. Wonderful mountain and rooftop views. Contemporary, quiet rooms in soft shade. Pretty gardens and pool. Gourmet cuisine. Close to the beach. A perfect all round hotel. Iconic 5* resort set in stunning gardens overlooking the Med. Rooms are classic and elegant, often with private balcony or terrace. Extensive wellness centre with indoor and outdoor pools, private beach and beautiful outdoor fine dining with views out to sea. Top notch luxury in unspoilt Maratea.